The best option if you want a full refreshing day! Enjoy the both sides of water! What do you enjoy more? Rivers or sea? Are you more like an adventurer, or do you prefer the glamour, music, cold drinks and relax under the sun? Maybe both? It is time to figure out with this summer special package of two aquatic activities for you to have some refreshing experiences and relax on your holidays. We propose a dynamic canyoning activity in one of our gorgeous canyons of Malaga or Granada, and another one to enjoy and relax with chill music on our bout that sails our shores. Start your holidays on sweet water! Enjoy the jumps, slides, rappels and long river pools where you can unleash all the energy you have been charging all year long. Swim and discover this incredible adventure activity surrounded by breathtaking landscapes. If you don´t know yet our top summer offers starting from only one participant, check: Guadalmina Level 1 (all days), Buitreras Level 2.5 (Mondays and Fridays), Rio Verde Level 2 or Rio Verde X-Pro Level 3 (Wednesdays) located on Cadiz, Malaga or Granada. This summer you can enjoy our four different offers even if you´re a group or if you´re having holidays on your own, joining our open groups and meeting new friends. The Guadalmina canyon is so close to Marbella, where we have canyoning activities everyday from 15th July to 15th September for 45€/participant. Join this adventure of a half day duration, you can schedule both in the morning or afternoon. If you´re more adventurous, sporty or you´re just looking for a full day adventure, we also have Buitreras Canyon (The Cathedral), Rio Verde or the “top canyon”, Rio Verde X-Pro, for whomever is looking for the best experience of canyoning in all Andalusia. And now chill out music, glass of cava and lots of salty water! After the canyoning adventure it´s time to relax, enjoy the sea and the landscapes of our shores. With the departure from Estepona´s harbor, every Wednesdays and Sundays at 11.00am, our boat will sail for 2.30h to the blue Mediterran´s waters. We´ll give you a warm welcome with a glass of cava, a snack and music to relax or dance. We´ll head to the deep sea to find the marvelous landscapes of our shores. You could lay on the beds of the stern or sit on a windbreaker at the prow. 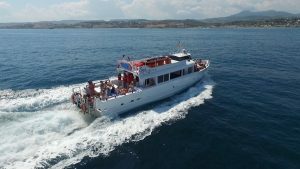 After sailing and relaxing over the sea waves, we´ll put down the anchor and you will have the opportunity to swim and dive on a unique spot. You will have some floats and water games for this refreshing moment. And If you´ve enjoyed the jumps on the river and just can´t stop, you can also jump from the boat to splash out your friends! Which won? Canyoning or boat chillout? We sincerely hope from TUUR that both experiences make your holidays even happier. Terms of booking: At least 2 participants for a booking. You can bring: swimwear and diving googles. Check here the exact location for the meeting point of this activity!